Over the Labor Day weekend, I was cruising through Herberger’s and lo and behold, found something to buy on the clearance table! I found some Fiesta Butterfly luncheon plates and a heart-shaped Fiesta bowl that said “Buy us!” So, I did and bought the usual 6 plates. Because if I didn’t, I would be kicking myself later that I didn’t buy 6! 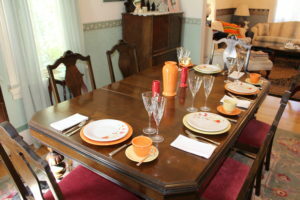 I was excited to create a table setting, so I used Fiesta P86 Yellow and Tangerine as complimentary colors (Herberger’s and various stores). I love orange and yellow together! Flatware was my Great-grandma Mayer’s Coronation by Oneida-perfect as Fiesta and Coronation were released in the same decade. Stemware is Cassandra Gold by Cristal D’Arques/Durand (thrift store). The grains and leaves in the stemware compliment the grasses found in the plates perfectly! Plain white napkins (vintage) round out the place settings. The simple centerpiece is a Fiesta Tangerine vase and two Fiesta Scarlet bud vases.